We have seen on previous pages many houses from the outside. House interiors also made it into some of the works of the Old Masters. Some of these are commissioned portraits. If an artist was painting a family then it was natural to pose them in their home. Other times the artist is telling a story, and the home is part of the story. Often as not, the house interiors are just the settings without taking any great part in the pictures, yet for our purposes they serve just as well. Whether central to the story or anciallary, the house interiors in these paintings gives us a glimpse into people's home from the artists eye. The date of the painting is 1610 and it is by Adam Elsheimer. This is a peasant's cottage, but a word of warning. 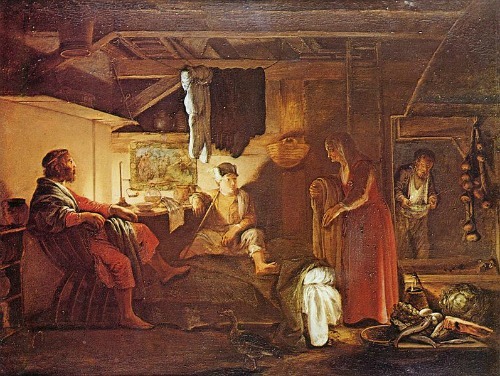 This is the artists idea of a Greek peasant's cottage, though he may have just used a local cottage for this scene. The gentlemen on the left is Jupiter in disguise, while the man looking somewhat like Elmer Fudd is Mercury. The old couple has taken them in unaware of their divinity. This is the story of Philemon and Baucis by the Roman poet Ovid. The walls are spare and appear to be plastered. The beams are exposed, but it rather looks like it is open above, except for a few boards. 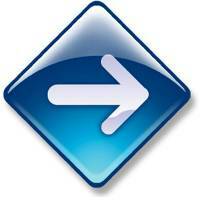 Access is via a ladder. Some kind of picture hangs on the wall over the right shoulder of Mercury. The house is timber-framed and it was not uncommon for such houses to be finished on the ground floor but open above. 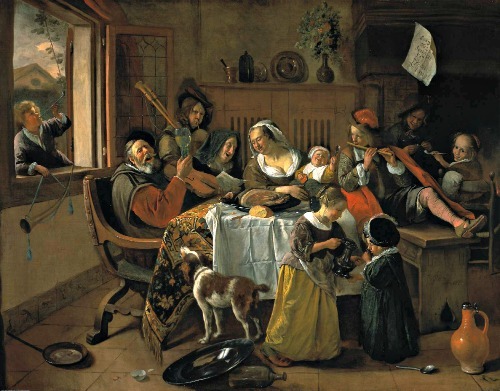 Jan Steen painted some lovely, and lively, scenes of home life. This is entitled "The Cheerful Family". One thing that is pretty common in these Dutch interior scenes is the presence of floor tiles. It looks like there are also decorative tiles at the base of the walls. The walls are plaster, but plain. The windows are leaded glass and swing inward. We can even see the hinges. The house in the background does not have a steep roof like the other dutch houses we have seen. It looks much like a house we could find in a subdivision in the U.S. There is a curious element to this room. In the background on the right there is some kind of awning or draping. I don't know the purpose but we will see it again in this next photo. Here again is the awning I mentioned in the last painting. 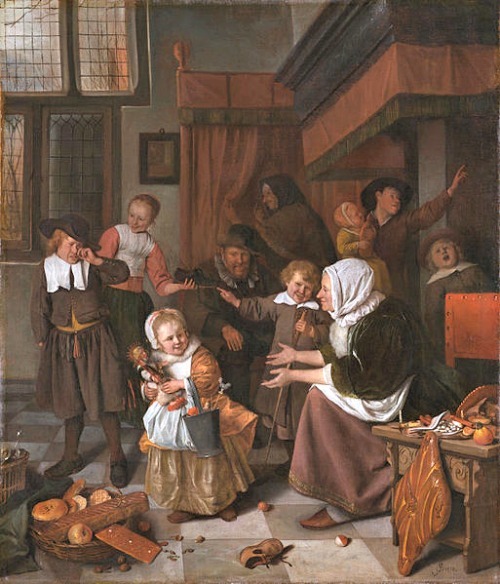 This is another Jan Steen painting and this time is shows a Christmas scene. The awning seems to cover the doorway and the entrance to the room. However, it is possible that there is an empty fire place there and the awning is meant to trap any errant smoke. If you look at the boy holding the infant he is pointing up, as if to say "See, Saint Nicholas comes down the chimney." Since everyone is dressed warm it seems odd that there is no fire going, but if you were expecting Saint Nick I guess you would suffer the cold for a while. There is also heavy drapery in the back corner. Perhaps this one covers a door. Yet the windows have no draping. 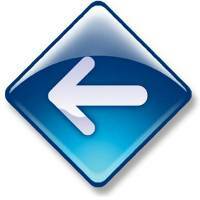 Its all very strange to my modern eyes. The windows are my favorite part of this scene. There are two banks of windows with the upper bank having an extra window so it is wider. We are going to see this again in another painting. I find this a very interesting window arrangement. In modern house interiors we would just have very large rectangular windows, but this old Dutch style seems much more pleasing. This is by Adriaen van Ostade, circa 1661. It is quite a mess. 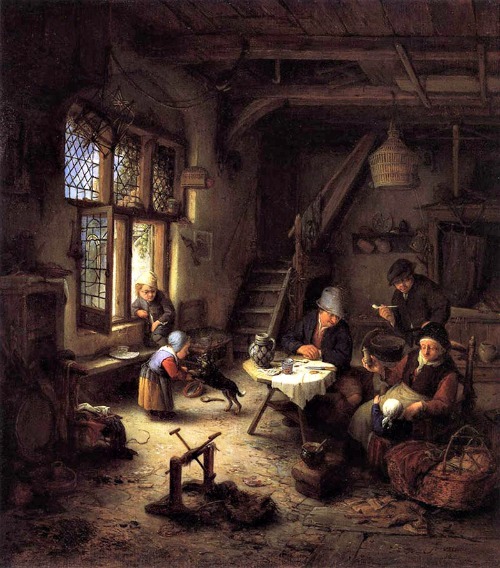 It is entitled "A peasant family in a cottage interior". This house lacks the tile floor and its furnishings are crude, but the house seems large and much like the other homes. Here we see the same arrangement of window. We see the whole window so we can see it is two wide on the bottom bank and three high on the top bank. The windows are again leaded glass, and seem to be just as nice as the windows in the painting of the Saint Nicholas scene. Next we are going to look at the interior scenes one particular artist, Jan Vermeer.